Orissa Post – Nayagarh: A friend in need is a friend indeed, a saying that vouches for true value of good friends in life. They are Nikilesh Pradhan and Roshan Pradhan of Nayagarh Autonomous College. Nikilesh is a student of Plus II 2nd year while Roshan studies in Plus III 1st year. He got in contact with Roshan while studying in Class VI of a village school and became his friend. Roshan was earlier junior to Nikilesh in classes but now he is senior. 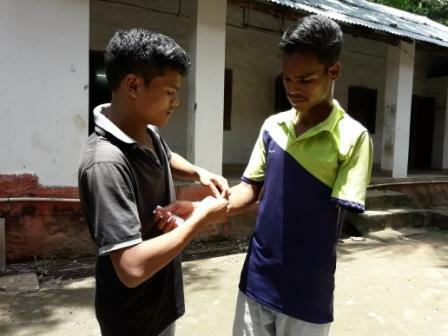 While Nikilesh aspires to become a sportsman in future, Roshan nurtures a dream to become a doctor.